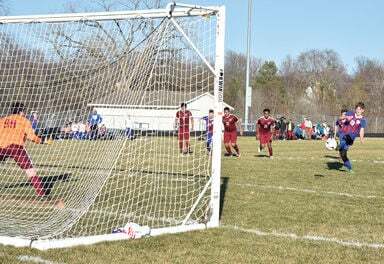 IAN GREINER TOOK A pass in the left corner and was enroute to a shot in front of the goal when he was tripped and got a penalty kick against Clarke, scoring in the corner of the goal. It would be Albia’s only goal of the night. ALBIA FULLBACK Austin Stanley headers the ball back toward mid-field as Eli Zanoni covers his back. ALBIA MID-FIELDER Adam Waber dribbles past a couple of Clarke players to move the ball into scoring position. 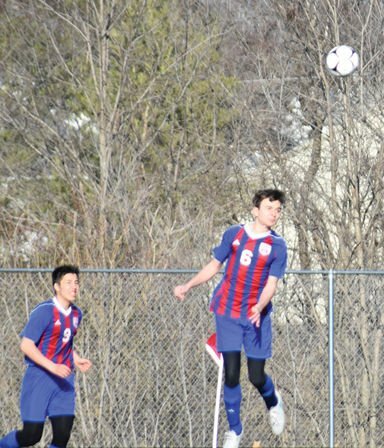 The Albia Community High School soccer team lost 2-1 to Clarke County on Tuesday night in Albia. “We came out a bit flat but found our legs and competed to the end,” said Coach Aaron Koester. The Indians were able to score early using a speed dribble down the right side and a shot rebounded off the goalie’s hands into the net. Albia scored on a penalty kick by Ian Greiner in the waning minutes of the half to make it 1-1 at halftime. Clarke managed the only goal of the second half, even though at the end of the contest Albia led in most categories including time of possession (58 percent), corner kicks (3-2,) free kicks (13-7). “But they keep score by goals and they had one more than us,” said Coach Koester. Clarke County scored their second goal at the 45th minute on a solid run down field. “We had some great shots down the stretch but just did not put it in the net,” said the coach. Albia falls to 1-1 on the season and will host Knoxville on Thursday, travel to Solon for a tournament on Saturday, and host Centerville on Monday.